In Canada, October is one of the most beautiful months of the year with fall foliage filled with oranges, yellows, and browns. There’s no shortage of fun activities to do with your family in October either. Pumpkin carving lets kids and adults alike show off their artistic side. Fairs and festivals, and farms are great weekend options that are always a blast. Thanksgiving on the second Monday of October mixes great food with family. And who can forget Halloween at the end of the month, where creativity and sweet indulgence is at an all-time high. Now, one of the best parts about October is there is so much great food. To offset the pounds you may have put on from the turkey and pumpkin pie, you’ll have to get active. Go for a hike and enjoy the fantastic fall colours, play football with friends and family, or spend the day picking fruit with the kids at a local orchard or farm and walk off those calories. Can’t wait for your turkey fix? 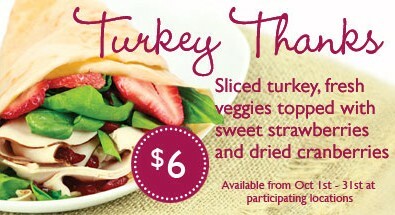 Our featured crepe of the month has you covered with none other than Turkey Thanks. With sliced turkey, fresh veggies, sweet strawberries and fresh cranberries, this crepe just might become your fall favourite. And at only $6 throughout October, how could you go wrong? Wishing everyone a safe and fun October.